From 1926-29, Mongolia issued a set of thirteen stamps picturing the Taoist Yin Yang and other symbols (Scott #32-44). Only 5,000 sets were issued, and Scott '14 prices the unused set at $283.-. 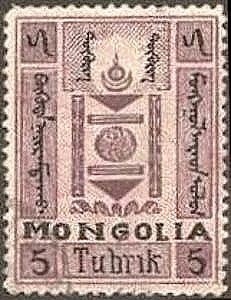 I consider the scarcer issues of Mongolia to be conservative long-term plays, because it is unlikely that there will be an appreciable increase in the number of stamp collectors in Mongolia in the near future. 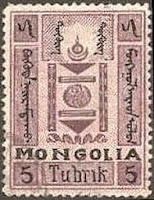 Currently, most of the demand for Mongolian stamps is based on the interest of specialists for the earliest issues, and topicalists for the later ones. Over the next few decades, however, I feel that the number of stamp collectors within Mongolia itself will increase significantly. With about 2.6 million people, Mongolia has successfully made the transition to democracy since the fall of the Soviet Union. 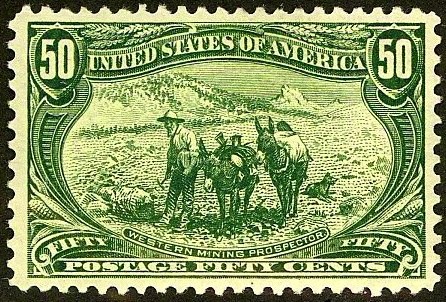 The main industries remain agriculture and mining, as Mongolia is rich in natural resources. There has been some diversification into the areas of food processing and apparel production, and annual GDP growth over the last 5 years has averaged about 10%.